I’m inter­est­ed in the way peo­ple react to tech­no­log­i­cal­ly-induced change. It seems to me that there’s a strong— per­haps over­whelm­ing? — feel­ing in some quar­ters that new tech­nol­o­gy is gen­er­al­ly awful and we were bet­ter off before. But I’m more inter­est­ed in see­ing the ben­e­fits as well as the draw­backs, in find­ing oppor­tu­ni­ty in trans­for­ma­tion, and I like to see exam­ples where rad­i­cal change is wel­comed. 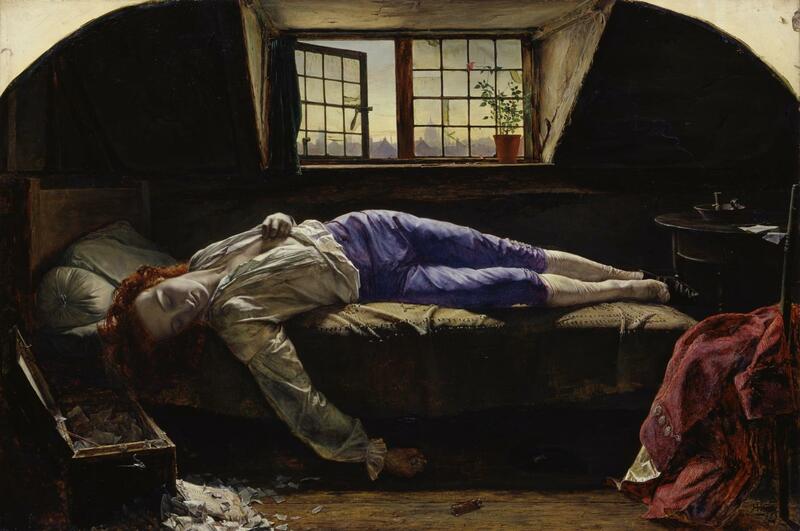 All that’s a way of intro­duc­ing Paint­ing With Light, a fas­ci­nat­ing new exhi­bi­tion at Tate Britain that explores the effect of the inven­tion of pho­tog­ra­phy on art, espe­cial­ly the 19th Cen­tu­ry Pre-Raphaelite soci­ety. (L) ‘Call, I Fol­low, I Fol­low, Let Me Die!’. Julia Mar­garet Cameron. ® ‘Bea­ta Beat­rix’. Dante Gabriel Ros­set­ti. Brief aside: I’m not an art his­to­ri­an so much of the fol­low­ing is based on my notes from the exhi­bi­tion plus brief online research and light pri­or knowl­edge. I take respon­si­bil­i­ty for any mis­in­ter­pre­ta­tion. It’s fair to say that many painters were not pleased by the inven­tion of the pho­to­graph (com­mon­ly dat­ed to 1839). The French painter Paul Delaroche is often quot­ed as say­ing, on first see­ing a daguer­rotype (the ear­ly form of pho­to­graph): “from today, paint­ing is dead”. But some artists were less afraid of the new inven­tion. The Scot­tish painter David Octavius Hill want­ed to record a major change in the Church of Scot­land in a pic­ture which involved hun­dreds of peo­ple. He worked with the pho­tog­ra­ph­er Robert Adam­son to get pho­to­graph­ic por­traits of all those present, and use them as a ref­er­ence to paint the scene over a peri­od of some 20 years. The fin­ished work, known as The Dis­rup­tion Pic­ture, looks rather like a pho­to­graph­ic col­lage; it has an air of Peter Blake’s work some 100 years lat­er on the Bea­t­les’ Sgt. Pep­per album cov­er. ‘Dis­rup­tion Pic­ture’. David Octavius Hill. © Free Church of Scot­land, Pho­to­graph by George T. Thomp­son LRPS. The great­est thing a human soul ever does in this world is to see some­thing and tell what it saw in a plain way. To see clear­ly is poet­ry, prophe­cy and reli­gion, all in one. Pho­tog­ra­phy is a noble inven­tion, say what they will of it. Any­one who has worked, blun­dered and stam­mered as I have done [for] four days, and then sees the thing he has been try­ing to do so long in vain, done per­fect­ly and fault­less­ly in half a minute, won’t abuse it after­wards. Ruskin’s the­o­ries heav­i­ly influ­enced the Pre-Raphaelite Broth­er­hood, a cir­cle of painters, poets and crit­ics, who dis­dained clas­si­cism and dis­cov­ered mean­ing in details pre­vi­ous­ly over­looked, ‘reject­ing noth­ing, select­ing noth­ing’. The Pre-Raphaelites were quick to see the advan­tages of pho­tog­ra­phy, using exten­sive pho­to­graph­ic ref­er­ence in paint­ing their super-detailed tex­tures, light and por­traits. ‘Bow­der Stone, Bor­row­dale’. 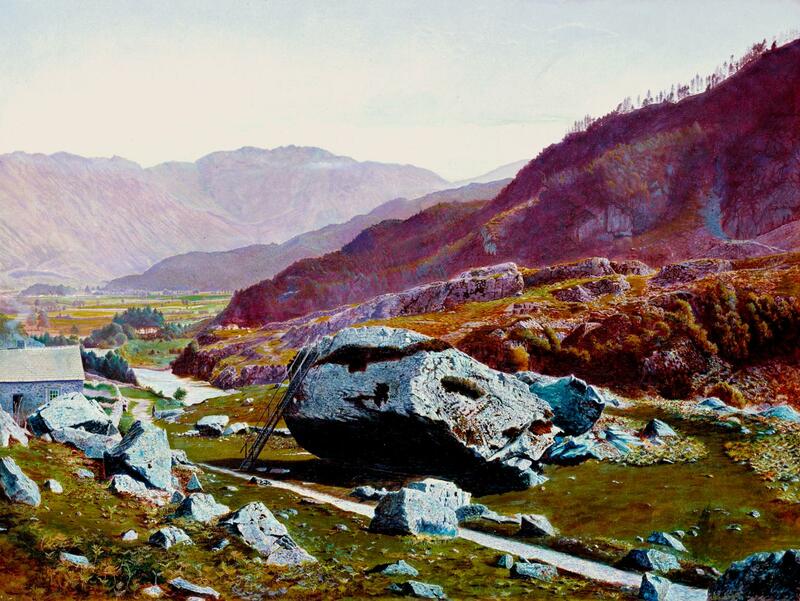 Atkin­son Grimshaw. Image © Tate, Lon­don 2014. 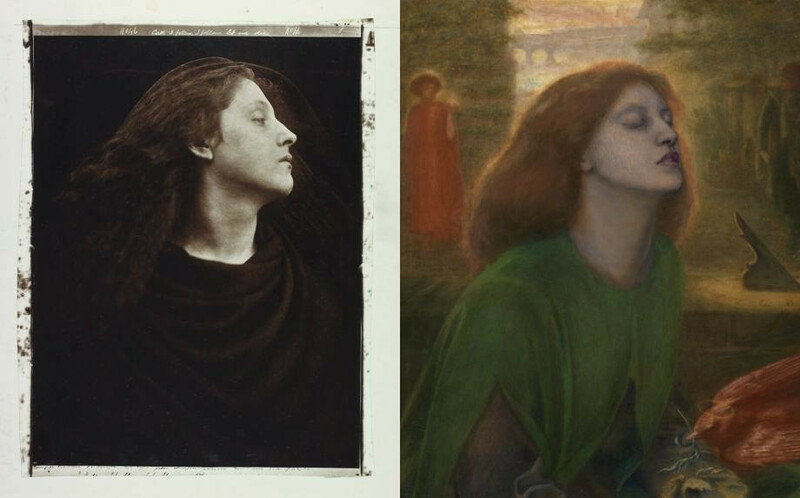 The seed of the flower of Pre-Raphaelit­ism was pho­tog­ra­phy. Pho­tog­ra­phy has sub­se­quent­ly influ­enced art in many ways, but it’s inter­est­ing to see that, at its incep­tion, those who might have felt that they were in com­pe­ti­tion — an artis­tic move­ment known for their devo­tion to the real­ism of detail — whole­heart­ed­ly embraced the new tech­nol­o­gy to improve their work. And in return, pho­tog­ra­phers were influ­enced by paint­ing, using the years of expe­ri­ence of com­po­si­tion and arrange­ment to cre­ate great works of art. There were a few oth­er notes of inter­est that I gleaned from the exhi­bi­tion. First, that some artists would take pho­tos of their paint­ings so that they could more quick­ly exper­i­ment with mod­i­fi­ca­tions and vari­a­tions; an ear­ly under­stand­ing of the util­i­ty of pho­to­copy­ing. And Pre-Raphaelit­ism and pho­tog­ra­phy also com­bined in an inter­est­ing way through Hen­ry Wal­lis’ The Death of Chat­ter­ton. ‘The Death of Chat­ter­ton’. Hen­ry Wal­lis. Tate Britain, scanned by Google Cul­tur­al Insti­tute. This paint­ing was phe­nom­e­nal­ly suc­cess­ful, draw­ing large crowds when exhib­it­ed. A cer­tain James Robin­son made a tableau vivant (a posed pho­to­graph­ic recon­struc­tion) of the paint­ing and sold copies of it. The cur­rent own­er of the pho­to­graph, Augus­tus Egg, was forced to take Robin­son to court: the first art copy­right case. ‘The Death of Chat­ter­ton’. James Robin­son. From the col­lec­tion of Dr Bri­an May. Robinson’s pho­to­graph is shown in the Tate exhi­bi­tion in the form of a stere­o­graph. 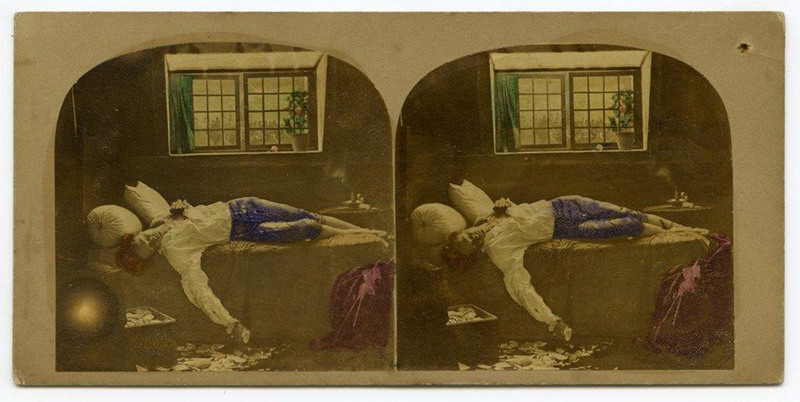 This method, invent­ed in the 1850s short­ly after pho­tog­ra­phy, involves tak­ing two iden­ti­cal images and dis­play­ing them side by side, then view­ing them through pris­mat­ic lens­es that cre­ate the illu­sion of depth. If that sounds famil­iar: yes, it’s how mod­ern VR works!